more safe and better fed from now on. This is an upcoming feature, not functional in the current version 3.40. Re: Arrow disappears Yep, checked the code paying attention to the latest pondering here and it's indeed simply so that there's no message when an arrow breaks due to impact of the hit. Arrows occasionally breaking upon it is naturally normal (and I actually can't recall if there ever was a message about it?). If we think it closely an arrow breakage inside target's body is harder to notice than seeing them splinter upon hitting a tree or so. Maybe we should add a message, or maybe we should add broken arrows to be carried by the target. On the other hand, I think my logic with broken arrows never being added to target's inventory was to save inventory slots from useless items. Anyway, the case solved here, now just considering what to do about it. Low priority. 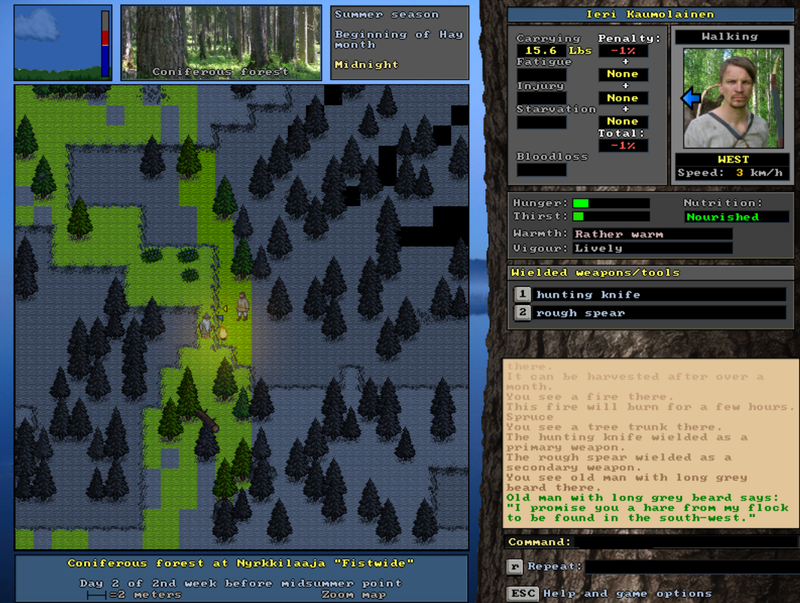 "Spirit of the forest, I presume" Now that sort of a phrase may actually slip from your lips in the next version of the game as the Spirit of the Forest gets added to our small cast of otherworldly creatures. Can someone post a link about historical fact of this. Also, I'd guess this is not strictly spesific to Finnish folklore. Something similar seems to be going on with crossroads. Re: Kotas You can build a kota as big as you want if you build a lot of frames and have enough fur/hides for walls/flooring. 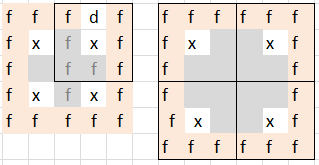 In my diagram, I put a box around the tiles representing the dimensions of a one-square interior kota and x is the tile you build the frame on. I colored the floor sections in grey and walls in orange. You'll need to build your frames apart by 1 or 2 tiles depending on the dimensions you want and all you need to do is build walls at the outside edges of the frames. I remember seeing somebody's picture of their livestock kota fence on one of the pages on the old forum's What's Going On In Your Unreal World? thread. It's a really good idea because predators can't break kota walls. Will this be implemented in the game? - And while the players are enjoying the new version, Sami and me will have the next version on the drawing board, deciding the major new features to be implemented in that version. So, because of the general psychology of the game development cycle, at the moment the answer to any and all "will a feature X be implemented in some future version?" is and will be "we don't know as at the moment we are fully focused on getting the beta release out". Put in other words; if there isn't an answer from the development team, it typically means that we are busy developing. Going into too detailed discussions about possible future features often just takes time away from the actual development.